Once again, renowned homiletician David Buttrick has written a highly practical book that conveys and makes contagious his excitement for the theological task of preaching. 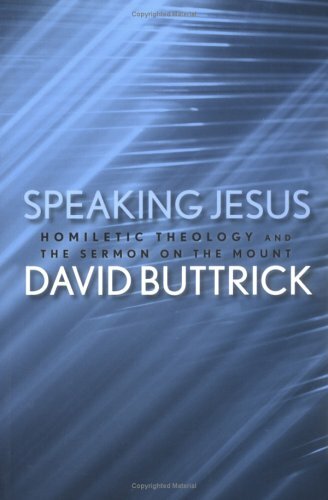 In "Speaking Jesus," Buttrick delineates the theological issues inherent in the Sermon on the Mount and presents a homiletical strategy for preaching its meaning and relevance. In Part One, Buttrick gives a general overview of the text and raises central theological issues imperative to its preaching, particularly the authenticity of Jesus' words and the sermon's relevance for today. In Part Two, he offers his commentary on Jesus' Sermon on the Mount, provides suggestions for preaching, and includes some of his own sermons as examples.